Antibodies and markers on the one hand, and specimens with small amounts of antigen on the other. They result from the interaction between the antibody cascade and the antigens. Successful labelling depends on the quality of the specific binding agent and the preservation and availability of antigen(s). Fixation, denaturation and masking of antigens play a major role. Antibodies may also recognize areas closely resembling epitopes in molecules other than the antigen under investigation. As undesirable as such reactions may be they are nevertheless based on specific interactions. Therefore, strictly speaking, considering such reactions as background is not correct. Strictly, background is the result of unintended “non-specific” reactions. They are governed by general physical chemical properties of both the specimen/substratum and of the primary antibodies and secondary antibody/marker conjugates. Immunofluorescence using Alexa 568 labeled Fab goat antimouse. For reasons of comparability areas of specific labeling are pictured with similar density (arrowheads). Left hand panel: Background using a commonly used protocol obscures sites of specific labeling. Right hand panel: N-Cadherin immunolabelled area obtained using Aurion Blocking Solution and BSA-c™ stand out with much clearer definition. Courtesy of Lauren Hruby and John Harris; Dept. Physiology, University of Otago, Dunedin, New Zealand. This is achieved by the combined application of AURION Blocking Solutions and the unique incubation solution additive AURION BSA-c™. The Blocking Solutions guarantee an effective and lasting specimen blocking prior to antibody exposure. Incubation with antibodies and labels as well as washing are done using AURION BSA-c™ which acts where it matters: preventing non-specific binding without affecting antibody-antigen interactions, interfering only where antibodies are inclined to stick to specimens. How does the blocking step work? When is a block step adequate? Appropriate blocking of specimens is the first step towards optimized immuno labelling results. Multipoint interactions between specimen and immuno reagents can be prevented by a Blocking Step, using proper blocking agents that have both hydrophobic and hydrophilic properties. This can be achieved in many ways, e.g. with solutions containing BSA or Casein and is most effective at a pH-value close to or slightly higher than the iso-electric point of the blocking agent. These conditions leave the blocking agent with little net charge, thus favoring hydrophobic interaction. AURION Blocking Solutions contain a specially selected and preconditioned BSA for enhanced multipoint interactions. During the adsorption process the BSA molecules interact with a surface via many interaction points which can bind over a certain time span. For the molecules to be desorbed however, all those interactions would have to become released at the same time. The chance for this to happen is very small, so an adequate blocking step is (certainly in view of the time of incubations) virtually permanent. Once blocking of hydrophobic areas has occurred, the areas have been rendered hydrophilic. Figure 1 shows an interpretation of the events during the block step. A: The blocking solution is applied. B: Blocking compounds like globular BSA molecules adsorb onto the specimen surface. Initially the adsorbed globular molecules do not share many points of interaction with the specimen surface as indicated by the arrows: BSA molecules can still relatively easily become washed off the surface. C: With time BSA molecules start to unwind so as to increase the number of interaction points: the blocking becomes less reversible. D: At the completion of the blocking step, most BSA molecules will share many interaction points (small arrows) with the specimen, the result is a firm binding. Important: There are still areas where specimen surface is exposed, as these are too small to be covered by large globular BSA molecules (large blue arrows with exclamation marks). Is the blocking step sufficient for optimum signal-to-noise ratios? providing a means to control the left-open spaces on the specimen surface. This is easily achieved with an incubation solution containing BSA-c™. BSA-c™ is an acronym for BSA in which high pK amino groups (in lysine and arginine residues) have been acetylated for increased negative charge, achieving linearisation of the protein and increased hydrophobicity. Figure 2 illustrates what happens when globular BSA is chemically modified to become BSA-c™. Amino groups react with acetic anhydride (CH3-CO-O-OC-CH3). The resulting secondary amino-acetyl (CH3-CO-NH-) group is electrically neutral and hydrophobic. The carboxyl groups (-COO-) are not modified and contribute to the increased net negative charge. The linearisation ensures a small cross diameter, making it easy for the BSA-c molecules to reach those areas in the specimen, that may have been left uncovered, in particular those areas with a positive charge (e.g. 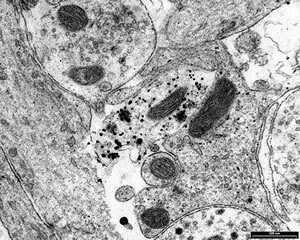 histone proteins in the nucleus, polyllysine coatings) but possibly also hydrophobic pockets. BSA-c™ is a unique AURION product that is prepared using proprietary procedures. When added to a buffer suitable for incubation and washing, BSA-c molecules compete with antibodies in particular for positively charged sticky areas in the specimen, even in the smallest corners. A BSA-c™ incubation solution at a concentration even as low as 0.1% outnumbers the antibody concentration by a factor of 3000-5000 and thus the acetylated albumin binds with preference to background sensitive areas in the specimen. The incubation solution is used THROUGHOUT all the immuno incubation steps INCLUDING all wash steps prior to and after the primary and secondary antibody (conjugate) incubations. The interaction between BSA-c molecules and the blocked specimen is pictured in Figure 3. Because of their small cross section diameter the BSA-c molecules fit easily in open spaces between the blocking molecules on the specimen surface, especially those specimen areas with a net positive charge (+++) and those that are hydrophobic (h). The interacting surface area is only small and it is therefore likely that BSA-c molecules desorb easily from the small holes in the blocking layer. Provided the local concentration of BSA-c molecules is sufficiently high, the surface of the specimen behaves at all times as if completely covered. Any incubation solution that provides an optimum environment for antibody-antigen recognition should also provide a continuous suppression of background reactions at the time when it matters most: when the specimen is incubated with antibodies. A proper incubation solution is thus as crucial as an appropriate blocking solution. AURION BSA-c™ is designed for incubation solutions and wash steps to complement the AURION Blocking Solution series. Antigen detection and BSA-c™: How does it work? With all of the specimen surface covered, how is it possible that an antigen is still available for detection? Although blocking molecules seem to firmly cover the specimen surface, the blocking is based on weak chemical interactions which are reversible. The continuous binding and “unbinding” of individual interacting points does imply that block molecules will be continuously tiptoeing on the specimen surface. Although the binding of BSA molecules as a whole to a specimen surface may be very strong, the individual molecular interactions are of low affinity. The same is true for the interaction of the BSA-c molecules with the specimen. Although BSA-c is hydrophobic and negatively charged, the molecule is linear and thus only small areas are interacting with the specimen resulting in low affinity binding. This is crucial to facilitate antigen detection. Figure 4 illustrates this. The dynamics of weak chemical interactions result in short lived and reversible release of parts of the blocking molecules and release of BSA-c molecules from hydrophobic or positively charged pockets between the blocking molecules. Whenever an area with antigen is exposed in this process the much higher affinity antibody-antigen interaction prevails over the weaker affinity interaction between BSA, BSA-c and antigen. The result is a specific detection. Primaries have little chance to bind in areas where there is no antigen present as the binding would be of lower affinity and the antibody thus has to compete with BSA-c molecules for binding. Since the BSA-c molecules outnumber antibodies by a factor of about 3000, a specific binding by primary antibodies is greatly reduced. 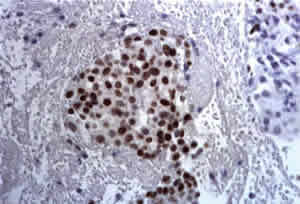 The secondary antibody binds to the primary which protrudes from the surface of the specimen. What is true for the primary is also true for the secondary (or further) steps: the conditions need to warrant specific interaction between bound primary antibody and labelled secondary antibody and at the same time prevent background from a specific binding with specimen areas. 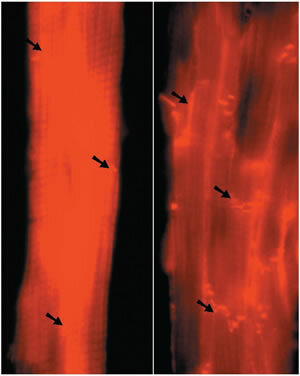 This is achieved using the same incubation conditions employing BSA-c™ as pictured in Figure 5. Essentially for the same reasons as described for primary antibodies, the labelled secondary antibodies have little or no chance to bind to temporarily exposed specimen surface as the binding would be of low affinity and the secondary antibody thus has to compete with BSA-c molecules for binding. Since the BSA-c molecules outnumber antibodies by a factor of about 3000, a specific binding by primary antibodies is greatly reduced and at times completely absent. The primary antibody is available for binding as required. The action of BSA-c™ taken one step further: charge and hydrophobicity. A summarizing and detailed explanation for the way BSA-c™ works can be given in terms of physical qualities of specimen, blocking components and the crucial incubation solution additive BSA-c™. Those qualities can be described as hydrophobicity, charge and the extent of surface area that would be shared between antibodies and any unconditioned specimen resulting from binding caused by these physical properties. At the pH of incubation, which is usually neutral to slightly alkaline, many antibodies are above their IEP and thus display a net negative charge. Specimens add to the complexity with their hydrophobic resins, histone proteins, lipid droplets, collagen, sticky coatings, the effect of fixation etc. If antibodies would be applied to unconditioned specimens charged parts of the molecules would be attracted to oppositely charged areas in the specimen (for instance some proteins of the cytoskeletal network, the extracellular matrix and the nuclear histone proteins). Likewise hydrophobic specimen areas would be prone to bind hydrophobic areas in the Fc tail of antibodies. In such interactions surface areas are shared between antibody and specimen. The larger the shared areas, or the more points of interaction, the more persistent the bond. Such multipoint interactions are long lasting and as a consequence difficult to remove. Background is the result. To prevent this from happening multipoint interactions need to be controlled even before incubations with antibodies start. Smaller areas of interaction, however, are not as persisting and therefore need to be dealt with in a different way: during antibody incubation itself using a proper incubation solution containing BSA-c.
After an appropriate blocking step the specimen surface is covered with blocking compounds. Negatively charged antibodies and antibody conjugates are repulsed by negatively charged specimen areas which often hold the antigens to be detected. Background does not likely occur in such areas. Exposed positively charged (as well as hydrophobic) areas attract antibodies and conjugates potentially leading to background. In a moderate ionic strength incubation solution, both repulsion and attraction are diminished due to the presence of ions like Na+ and Cl-. The negatively charged BSA-c molecules successfully compete with the negatively charged antibodies and conjugates for non-specific binding to specimen areas, thus reducing background to the greatest possible extent without interfering with antigen detection. The following dot-spot test illustrates how the charge dependent background is suppressed by BSA-c™. In this dot-spot test methylated BSA (methBSA++) serves as model molecules with strong positive charge at physiological pH (strips 1 and 2). 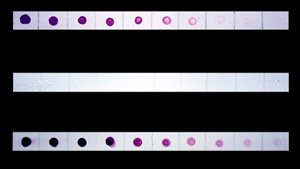 The bottom strip (3) was set up using a mouse IgG dilution series. Note the signal to noise ratios: high (3 and 2) when using BSA-c™, low (3 and 1) when using ordinary BSA as incubation solution additive. Strip 1: a spot series of methBSA++ incubated with a Goatanti- Mouse 25nm gold conjugate using an incubation solution containing BSA. The colored spots are indicative of binding of the antibody conjugate to positively charged areas. Plain BSA does not significantly suppress charge interactions. Strip 2: conditions as in as strip 1 but now using Aurion BSA-c™. There is no visible background. Strip 3: specific detection using a spot series of mouse IgG incubated with Goat-anti-Mouse 25nm gold conjugate with BSA-c™ as incubation solution additive. Immuno incubation procedures designed for pre- and post-embedding applications are described in our package inserts and in the technical support section of the AURION Product Catalogue. Please contact us for a free copy. AURION BSA-c™ is an incubation solution additive and should only be used for that purpose. Please do NOT use BSA-c™ as a blocking reagent. Its binding to a clean specimen surface would be too strong to allow antigens to be easily detected! Immuno Gold/Silver labelling with a mixture of anti-GnRH and anti-GFP using Aurion Ultra Small Gold labelled Fab2 goat-anti-rabbit and Aurion SE-EM silver enhancement. Axons were pre-embedding labelled using Aurion Blocking Solution (to match Goat conjugates) and BSA-c™. 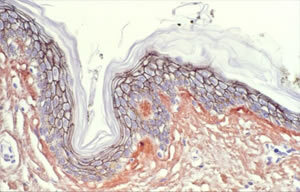 Immuno Gold Silver Staining (IGSS) of E-Cadherin on a paraffin section of human skin. Mouse monoclonal anti E-cadherin, Goat anti Mouse Ultra- Small and AURION Silver Enhancement for Light Microscopy (SE--LM).The IGSS signal can be seen as a dark staining around the epithelial cells (in blue).